To celebrate the 40th birthday of one of the world’s most famous picture books, I have 10 Hungry Caterpillar inspired activities. Maths: Build caterpillars from dough or clay. Count the number of segments that make up the caterpillar. 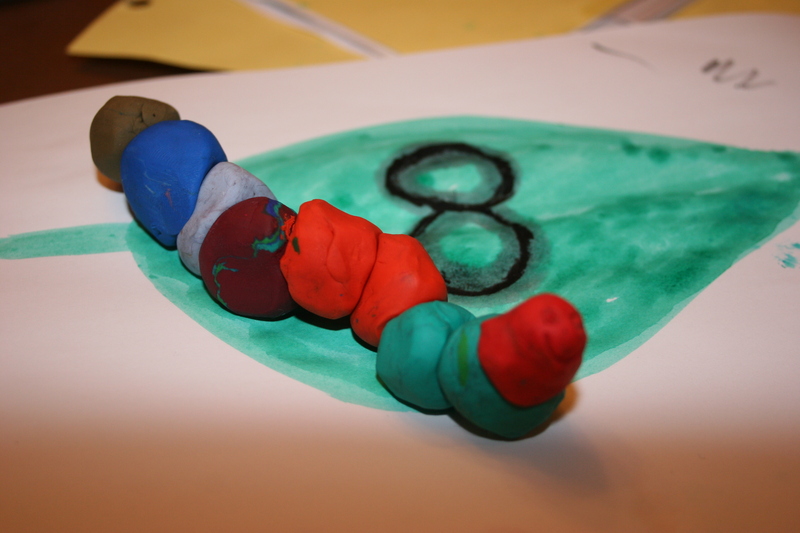 Play a matching game – place the correct caterpillar on the leaf with the matching colour or number of segments. 2. 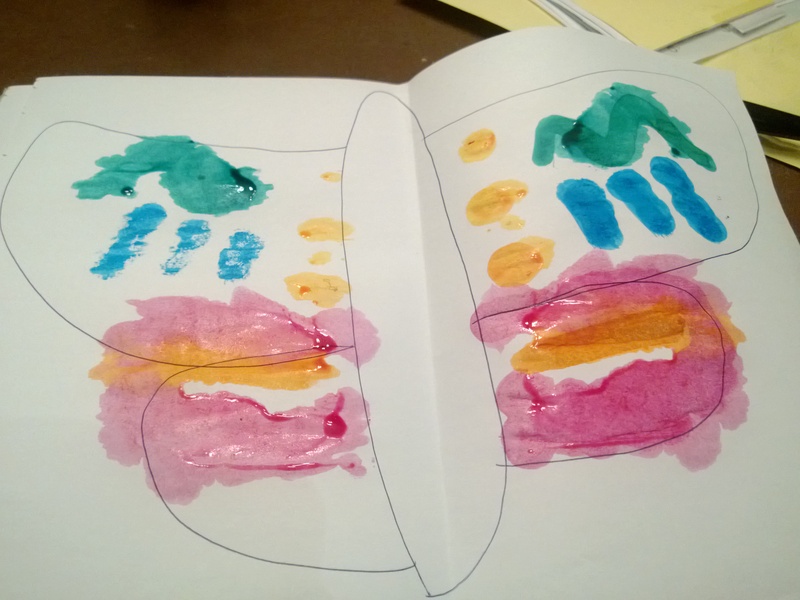 Imaginary Play: My eldest followed an enveloping schema for years. She would hoard things in little bags and containers and if you ever left anything around that she could climb into, you would find her inside. On one occasion I left a fabric storage bin in her room. She promptly climbed inside declaring that she was in her cocoon and soon emerged as a beautiful butterfly. Provide material, boxes, play tunnels, blankets, wings and deely boppers. 3. Song and Rhyme: Sing the caterpillar on a leaf song or sit behind your child and pretend to crawl a caterpillar up their back. Teach them to ask ‘Whose that climbing up the garden wall?’ and you reply in a caterpillar like voice ‘It’s me’ said the caterpillar ‘I’m learning how to crawl’. 4. Paint symmetrical butterfly pictures: I’m sure we all remember these from school days. Paint on one side, fold the paper over to create a symmetrical print on the other. This can also work well by painting a piece of string, placing it between the folded paper and then pulling it out whilst the paper is still folded. 5. Movement: Read the Hungry Caterpillar and give the children movements to follow during the story. Egg – curl up in a ball, caterpillar – crawl along the floor moving to eat different types of food, big fat caterpillar – stretch out wide, cocoon – spin slowly then hang their head between their legs, staying very still, butterfly – flap their wings and fly. 6. Discovery – it is a little cold yet but once the weather is warmer, grow your own butterflies. We have done this very successfully using kits from Insectlore. It is fascinating to watch how quickly the tiny caterpillars grow and then instinctively hang upside down. You soon get to recognise when the butterflies are ready to emerge and can feed them indoors for a day or 2 before releasing them into the garden. The species that they use tend to stay within your local area for a few days after being released so you can spot them in the garden. Find out about the butterflies and caterpillars that can be found in your locality, and print pictures of more exotic species. 8. Maths: Turn your finger into a crawling caterpillar and measure things in caterpillar steps. 9. Outdoors – Grow a butterfly garden. I saw some amazing butterflies in our garden last year that are fairly commonplace in this area. I’m definitely going to learn about how I can attract them this year. 10. Visit a Butterfly Farm. I can highly recommend the butterfly house at Bristol Zoo and Felinwynt Rainforest Centre in West Wales. In Seattle there is the Butterfly House at the Pacific Science Centre . Feel free to add any recommendations in the comments. Previous PostTwo Mother’s Days: One for Remembrance and One for MeNext PostOutdoor Play: Making Muddy Footprints Isn’t Always Easy.